The FAA has published hundreds of “grids” depictingthe maximum allowable altitudes for unmanned aircraft operations near airports.Composite image made from FAA facility map screen shot and AOPA file photo. The FAA implemented Part 107 in August 2016 after a lengthyrulemaking process, and this year began publishing](https://www.aopa.org/news-and-media/all-news/2017/july/06/faa-continues-uas-map-rollout) “grids” developed in collaborationwith airport tower staff that depict the maximum safe and permissible altitudesfor unmanned aircraft operations. The FAA published those maps through an online portal fordelivering unmanned aircraft data to aviators, and has long planned to usethe UAS maps to automate airspace authorization requests through the LowAltitude Authorization and Notification Capability (LAANC) system. Remotepilots certificated under Part 107 who submit requeststhat comport with the published limitations through the current system canexpect approval, the FAA has said. The FAA had expected to take until the end of the year toimplement the electronic authorization of LAANC, but the abundance of reportedsafety incidents and the backlog of airspace authorization requests receivedonline created a logjam that the FAA hopes to clear by expediting the LAANCimplementation. The FAA expects LAANC will reduce “non-compliant” operations byat least 30 percent, cutting the number of reported safety incidents by 450 inthe coming six months. The FAA notice was published a week after the NTSB confirmed the first midair collision](https://www.aopa.org/news-and-media/all-news/2017/october/05/drone-pilot-provides-data-from-black-hawk-midair) involving a drone anda manned aircraft, a UH-60 Black Hawk helicopter that was patrolling New YorkHarbor during the United Nations General Assembly in September. The helicopterlanded safely despite main rotor damage, and a piece of the drone was recoveredfrom inside the helicopter that led investigators to the operator with helpfrom drone maker DJI. The area where the Sept. 21 collision took place does not appearto be within an area where a drone flight could have been authorized, given thetightly controlled New York Class B airspace and the presence of flightrestrictions to protect the U.N. General Assembly. The U.S. Army, NTSB, and FAAare all investigating, and no sanctions have been announced against the pilot,who is cooperating with the investigation, NTSB officials said. More and more people are flying drones. Transport Canada regulates their use to keep the public and other airspace users safe. Before you take to the skies, make sure you understand the rules and follow them. Not doing so could put lives at risk and cost you up to $25,000 in fines and/or jail time. Transport Canada is proposing new regulations to address the safety requirements, growing popularity, and economic importance of drones. Learn more about the Proposed rules for drones in Canada. Montreal No Drone Fly Zone. I need to update the regulations once they are approved, but here’s the interactive map for Ontario. Drone flying - Interactive help from your Home Inspector at Future Proof. Flying a drone is difficult enough. Now the regulations are changing. Here's an interactive map of where you need special permission to fly your drone. Canada’s drone laws could be relaxed in the nearfuture, paving the way for recreational users and first responders to reach newheights. it suggeststhe government come up with new regulations using information it learns from apilot project that will allow Canada’s first responders to fly drones fartherthan current laws allow . I am looking at purchasing a drone. Great for envelopes and roofing systems. I am sure regulations will relax as time moves forward. I tried the first generation and gave up = too fragile and then made myself a version of the “spectroscope” (not as good… but functional). Then too many drones - especially around airports - became controlled by applicable laws! You need to be a pilot to have a drone, or nearly! So I’m an ex-pilot and not current and have no intention to renew my pilot’s licence to fly a drone! G, never give up. You’re the best. Fling is lots of fun. I started with fling string controlled, alcohol / glycerin lubricated, powered planes at 30 and moved on RC about a decade ago. First generation battery mini drones. Then remote with GPS visual flight. The GPS was not as accurate as they are today. The drone would drift off GPS position. Accuracy is paramount. If you have an accident with DJI you can purchase all the pieces to rebuild a drone, including a chassis accident. The downside is waiting for the parts, tools and being semi skilled as a handyperson. I will likely be purchasing an entry level drone, ><$1,800 for envelopes and roofs. Professional models start @ ><$10,000 with a good lens. If you plan tofly a drone for fun you must learn and follow the laws that apply torecreational drone use. If you are usingyour drone for work or research, you will need special permission to fly yourdrone. The army hasbeen called in to help with the situation as tens of thousands of holidaytravelers remain stranded. leaving planes grounded fornearly 24 hours and tens of thousands of travelers stranded. The drone sightings began Wednesday around 9 pm local time](https://www.theguardian.com/uk-news/2018/dec/19/gatwick-flights-halted-after-drone-sighting) in Sussex, wherethe airport is located. Britain’s Guardian newspaper](https://www.theguardian.com/uk-news/2018/dec/19/gatwick-flights-halted-after-drone-sighting) reports, but waspromptly shut down again just 45 minutes later after another drone sighting. 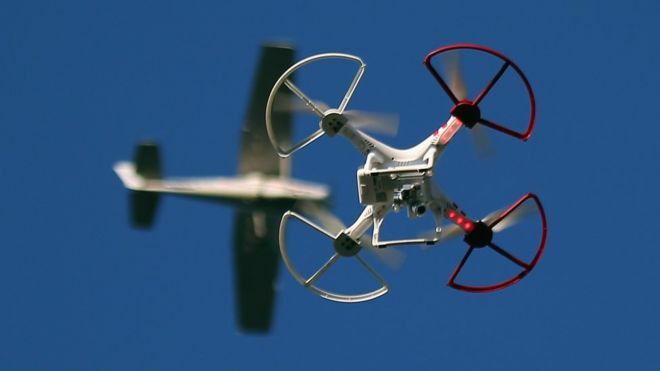 A drone was spotted yet againaround midday on Thursday, and the airport has remained closed.